Yuken Teruya has an art series called "Notice" in which he has created dioramas from used fast food bags, and they are breath-taking. He cuts delicate tree shapes from the bags and folds them inward, so that the viewer sees them when looking inside the bag. 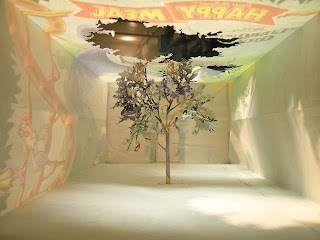 According to the artist: "When you see it under the natural light, the delicate tree shows inside a paper bag, shows us the strength and the proof of existence of living tree." As you can see in the image, the end result is mind-blowing. Consider the perspective, and the actual size of the tree... the detail is extraordinary.